Polar bears have become a poster species for climate change. Big, strong, scary, exotic, proud and ever so cute when they emerge from the den to tumble down the snowfield, they are icons. Like lions and tigers they are what we want to be. We love them. Most of the year they spread out across the Arctic sea ice in search of ringed seals that form the bulk of their diet. Enter global warming and its effect on ice caps . The logic is hard to escape. Warmer polar temperatures means ice caps shrink, sea ice gets thinner and takes longer to freeze. A few images of a 500 lb white bear struggling to walk across thin ice and we are worried for their survival. Surely without ice to walk on they will perish. The rock star species becomes the poster species for the fight against global warming. With warming the species is sure to be under threat of extinction. The problem with the logic is that polar bears climate change seem to prefer areas where the ice moves as this is where prey is more plentiful. They are adapted to swimming and can cover long distances in the water. So some thinner ice and changes to the freezing patterns may not be such a problem. And the arrow on this graph indicates the time when the fossil record and genetic evidence tells us polar bears, Ursus maritimus, first evolved from brown bears, roughly 200,000 years ago. This makes sense given that this was a cold period. What the graph also shows is that these majestic animals survived the last warm period that was warmer than today. Reports of the demise of this species due to warming may well be premature. More significant is the fishing that affects the seal populations and the hunting of bears that is still permitted. As usual with many conservation problems it is human pressure interacting with the environment that is the real issue. Latest research suggests that polar bears are not descended from brown bears as was first thought. They are much more genetically distinct. The current thinking is that there was common ancestor around 600,000 years ago. 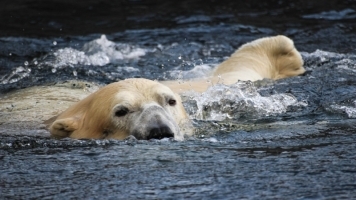 The new data in an article on polar bears climate change was published in Science, a highly reputable publication that would have double-checked the results through the normal scientific peer review process. What it means if this is true is that the species has survived not one but at least four periods of significant warming when ice caps would have been significantly reduced. Pictures of bears on tiny icebergs floating along on the ocean make for great imagery. It is so readily emotive that most media companies cannot resist it. Whether the polar bear arrived as a species 150,000 or 600,000 years ago it has survived several warm periods and it will survive this one if it weren’t for humans. The reality is that it is commercial fishing that puts pressure on seal populations (the main food) and the hunting of bears that is still permitted. As usual with many conservation problems it is human pressure interacting with the environment that is the real issue, not the environment on its own.